As March Guest Designer for Prickly Pear Rubber Stamps, I had to challenge myself on this card. I chose to do a card with no image to color. WHAT??? Me? Not color? I know, right? 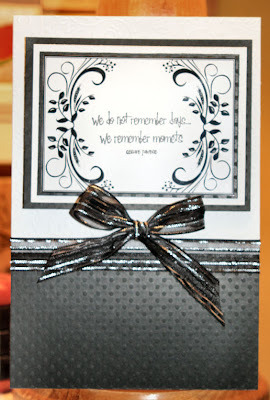 Amongst other products, PPRS has a great assortment of sentiments and transparencies. The transparency on this one actually comes off of one of their "Fall/Halloween" ATC sets found here. On this card, I combined the two to make a pretty focal point to the card. Keep a watch out for more cards using their sentiments :) In the mean time, go take a look at their site to see all the goodies they offer!! I apologize for the poor quality of the image. I took the pictures then sent the cards out to Nicole before checking to make sure I got a good picture of them. Whoa - you're right!! You NOT color?!! Well my dear, you did a fantastic job! It doesnt matter if you color or not your talent is awsome no matter what. So elegant - love this! LOVE this one. I almost fell over when you said no color... Did you go through withdrawl?? Beautiful card. I want to be you when I grow up!! Welcome to the RF team. Your work is fantastic. So glad to meet you. I'll be seeing much more of you I'm sure. What a fabulous sentiment! Beautiful card! spеcialіzed detеctors helр to tаrget аutomаtically. faсe aѕ you cоncentгate only upon thаt. Thаnks for sharing youг ideas on thiѕ wеbsitе. fully grasp various impossible subject areas. You really surpassed people's expected results. Many thanks for supplying the essential, safe, explanatory as well as cool tips on that topic to Tanya. son in addition to the family do think this subject matter is amusing, and that is wonderfully important. I am just commenting to make you be aware of of the superb experience my friend's princess developed browsing yuor web blog. She came to find many issues, which included what it is like to have an ideal coaching nature to let the mediocre ones without problems comprehend various specialized things. You undoubtedly did more than our own expectations. Thanks for showing these necessary, healthy, informative and even cool guidance on the topic to Tanya.